Bad guys in Fletcher Hanks stories have lots of ways of being bad. They think big and have never heard of hubris. Once the villains set their plot in motion, citizens get hurt in terrible ways. These stories were created before comic books had been codified to be safe for kids. In a Hanks story: anything goes. Superman had the power to fry evildoers into ash with his heat vision, but he was a Truth, Justice, and American Way kinda lad, so he instead of igniting them, he just tossed crooks into the hoosegow. Hanks’ heroes, by contrast, brought down the flaming sword of retribution for page after page of escalating torture. At a casual glance, Hanks’ drawing may appear crude. It is. Characters are draw over and over with the same expression. But his drawing can also be extraordinarily beautiful. Hanks created Fantomah, who beat out Wonder Woman by several months to the claim of being the First Female Super Hero. She is the white (of course!) protectoress of the jungle who, when she gets pissed, turns from Carole Lombard to Skeletor, and dishes out frostbitten, ice-cold vengeance. She was not only the first super heroine, but even now, decades later, it’s hard to find a subsequent one who ever topped her cold-blooded weirdness. A literary device as old as the hills lasts because it works. When Mr. Bumble tortures Oliver Twist in the workhouse, it is very satisfying to see Mr. Bumble eventually undergo torture and end up destitute in the same workhouse. Hanks takes this and runs with it. Simmering a fraction of a millimeter below the surface of every Hanks story is anger stewing in a hot broth of misanthropy. Humanity is a vast undifferentiated sprawl of idiot victims. On one side of this nincompoop sea are ugly, scheming brutes whose greed and sense of superiority pose a threat – and on the other, to protect the hoi polloi despite their apparent worthlessness, a team of superior Super Wizards and Jungle Goddesses. Graphic design is a key skill for the cartoonist who must deliver sequential information so that it is ingested in the proper order. 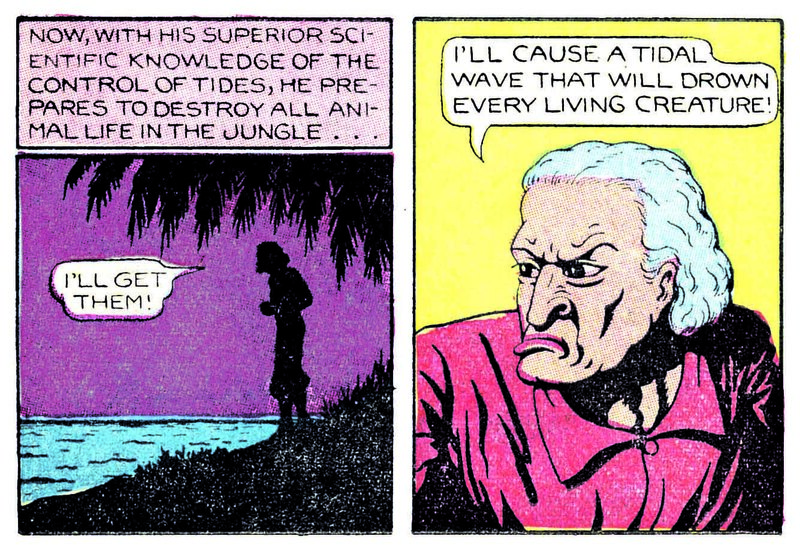 Hanks, despite his apparent devotion to chaos as a principle, is a master designer of the comics panel and page. Here is a page that has everything one could want from Fletcher Hanks: violence, surrealism, anger, poetic justice, and beauty all delivered by a man who knew how to intentionally guide the reader from top to bottom and left to right with confident ease. 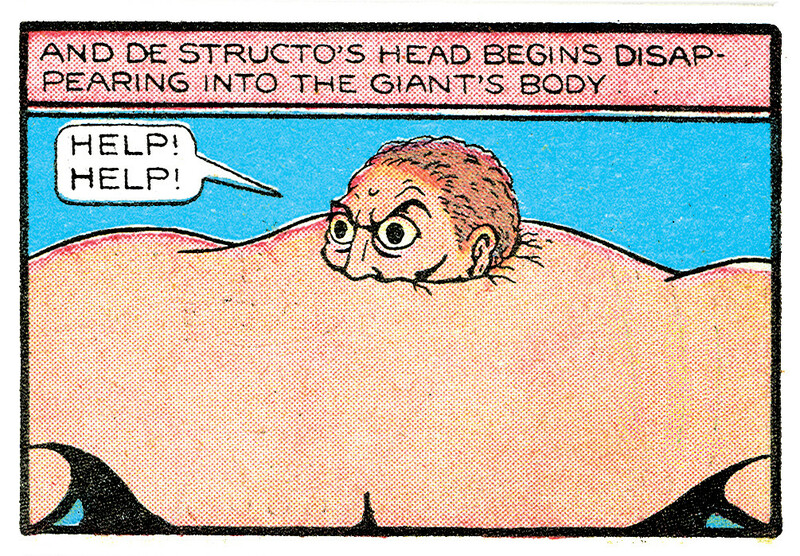 If Hieronymus Bosch and René Magritte had dropped acid together and collaborated on a comic in 1939, it might have looked as bizarre as a typical Fletcher Hanks story…but probably not. There has never been any artist like Fletcher Hanks. “Turn Loose Our Death Rays And Kill Them All! : The Complete Works Of Fletcher Hanks.” Purchase directly from Fantagraphics and receive exclusive Fletcher Hanks mini-coloring book, “Color Me or Die” with a cover by Charles Burns.